Safety awards are among our most requested recognition awards. We offer two primary "pre-sculpted" designs for safety awards, meaning that most of the initial start up costs are done and don't have to be borne by the customer. However, both designs are "customizable" for a small one-time charge, enabling organizations to have their logo or logotype sculpted into the awards. Our smaller hard hat awards are approximately 7" high (3" sculpture on a 4"x4"x4" concrete base). These awards cost $395. Our larger hard hat awards are life-size and mounted on a standard 6.5"x6.5"x10" concrete base. These larger awards cost $2,050. Alternate base materials (marble for the small hard hats and wood for the large hard hats) and larger, perpetual bases are available upon request for an additional fee. A second design is based on a safety cone. These awards stand approximately 7" tall (5" sculpture on a 5"x5"x2" marble base). Concrete and wood can be quoted upon request, as can larger perpetual bases. Like the Hard Hat awards, these sculptures are cast in pewter and feature a brushed pewter finish. These safety cone awards cost $295 each. 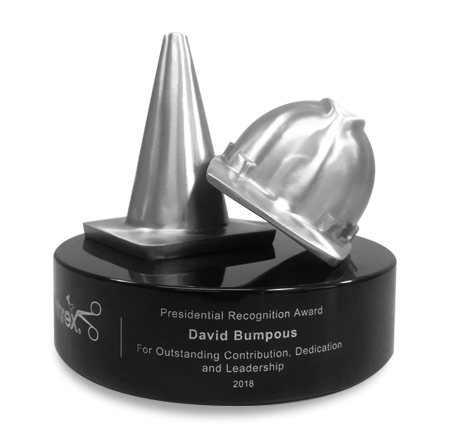 We also offer a safety award that combines both a small hard hat (3” tall) and cone (5” tall). These sculptures are affixed together, and then mounted on a circular base (8” diameter x 2” high). These combination safety awards cost $795 each. Any of these safety awards can have an organization's logo or icon sculptured into the front of the sculpture for a one-time set-up charge (to cover modeling and mold costs). This set-up charge is $295 for the small hard hats, and $395 for the large hard hats and safety cones. Custom medallions can be created and attached to the front of the base. These can be quoted upon request based on size and design complexity. Engraved plates can be added to any of the bases for an additional charge. This charge will vary based on the engraving direction, and will be quoted upon request.